taken in Austin Texas, is not my work. It was available at Wikipedia. The evening of 12 August and morning of 13 August see the annual maximum of the Perseids meteor shower. This year prospects for watching this natural firework display are particularly good. Meteors (popularly known as 'shooting stars') are the result of small particles entering the Earth's atmosphere at high speed. These heat the air around them, causing the characteristic streak of light seen from the ground. For the Perseids the material comes from the tail of Comet Swift-Tuttle, which last passed near the Earth in 1992. 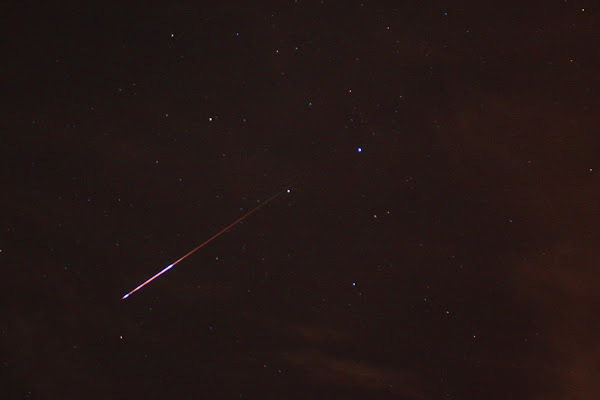 This shower of meteors appears to originate from a 'radiant' in the constellation of Perseus, hence the name. The shower is active each year from around 17 July to 24 August, although for most of that period only a few meteors an hour will be visible. From the UK the best time to see the Perseids shower is likely to be from late evening on 12 August to the morning of 13 August, when as many as 60 meteors an hour may be seen. This year prospects for the shower are relatively good, as the Moon is a waxing crescent and from most of the UK will have set by 2230 BST, meaning that its light will not interfere significantly with the view. Unlike many celestial events, meteor showers are straightforward to watch and for most people, the best equipment to use is simply your own eyes. Advice from longstanding meteor observers is to wrap up well and set up a reclining chair to allow you to look up at the sky in comfort. If possible it also helps to be in a dark site away from artificial light and have an unobstructed view of the sky. Although the number of visible meteors is hard to predict accurately, you can expect to see one at least every few minutes. They mostly appear as fleeting streaks of light lasting less than a second, but the brightest ones leave behind trails of vaporised gases and glowing air molecules that may take a few seconds to fade. This post was published by Shirley for shirls gardenwatch in August 2013. Hi there, Marion - delighted I reminded you here :-) Hoping your sky was clear enough - did you get good views of the shower? It is much too overcast here to see anything in the sky tonight. I am ever hopeful for rain. Thanks for sharing. An awesome display on the east coast. Hoping to see some more tonight. Wonderful, the Willow Warbler returns!